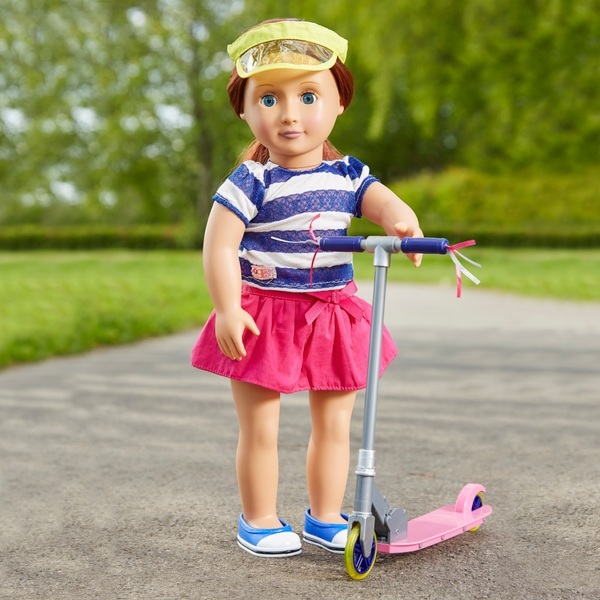 Your Our Generation doll will be scootin’ in style with this deluxe scooter set featuring a bright and breezy summer time outfit! Blue, white, yellow and pink make this cool outfit pop from the visor to the skirt and shoes. With festive handle bar streamers, bright yellow wheels and a pink platform this suave scooter is a fun way for your Our Generation doll to go to the park or visit with friends! The realistic looking popsicle makes this summertime outfit more than just fun fashion! (Our Generation doll sold separately.